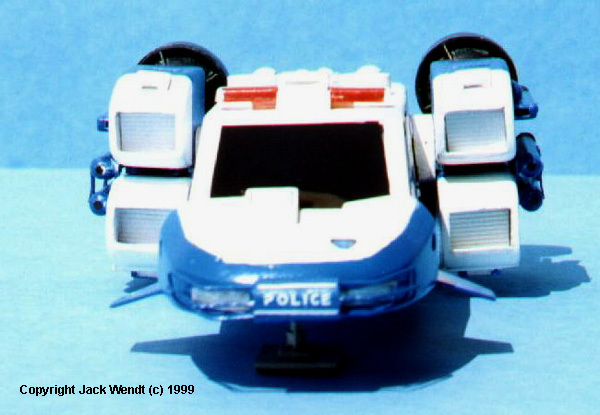 Jack Wendt's scratchbuilt Space Precinct police cruiser..
By Jack Wendt Copyright © 1999. "The name's Brogan, Lieutenant Brogan. For twenty years I was with the NYPD. Now - well let's just say I've transferred to another Precinct." This was a live action series from Gerry Anderson. It involved human police officers working with aliens on a rather large space station. Sound familiar? 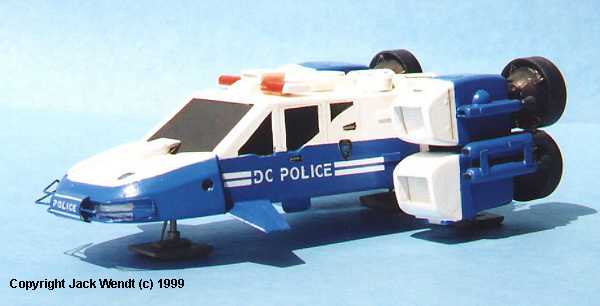 The Demeter City police cruiser was the main mode of transportation and it could function in space as well as in the atmosphere of a planet. I worked with only about 8 photographs of the cruiser. I got these entirely from people or web sites on the net. I first cut, and sanded a piece of pine for the main fuselage. I then vacuformed the plastic over the blank. It turned out that the car was too tall, and too long. The shape appeared right. I cut a section of the back and I cut the top off an lowered it. After priming, and sanding, I painted the front of the fuselage black. I then took .10 thick styrene sheet and cut out the windows and door handles on the side. I then glued these strips to both sides of the cruiser. This left the windows and door handles recessed. I used strip styrene for the frame of the front windshield. I then used scotch tape to mask the windshields and side windows. Getting the nose with it's complex curves required laminating several strips of thin styrene. I first took the strips and curled them around my Xacto™ knife this put less strain on the glue while drying, and made bending easier. I also had to use a lot of putty on the front of the vehicle. The 2 flat round objects that are to the rear of the vehicle, on top, are the silicate holders put in with some medications to absorb moisture. The 2 oblong rounded curved pieces at the back just forward of the engines are from a disposable dropper. Next, I proceeded to make the main 4 thrusters. After cutting out the shapes I laminated strips on the top and the bottom to get the right thickness, as before first curling the strips around my knife handle. The insert for the front intake of the 4 engines is sheet styrene that can be purchased. It is listed as corrugated, as in tin, for buildings that you see in connection with model trains. The smaller side thrusters that are attached to the main thrusters came next. I used tube styrene for the body. I took a round ink pen top, held it in a vice, and heated styrene over a candle. I held the styrene with hemostats (locking surgical clamps). I then pulled the heated styrene over the ink pen top. This gave me the shape of a small dome which is attached to the front and back of the tubes. For the small thruster cones, 6 of them on the side of the 4 main thrusters, and 2 in the center of the top, I used a similar technique in which I used a ball point pen. I have several that are plastic, but the very bottom, as where the ink cartridge/ball point protrudes, is metal. Using the same technique I heated a piece of plastic, pulled them over the tip of the pen, and used the metal part as a cutting line to cut around the circumference. The rear engines were made using wooden Easter eggs, available at hobby and craft stores. Click on a picture to see a larger view. ^Beauty shot of the parked cruiser. ^ Most of the detailing on the back deck came from odds and ends from the parts box. 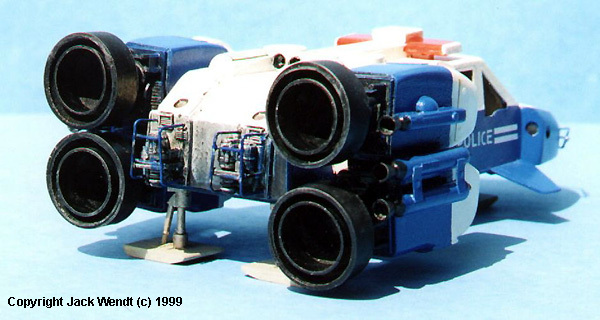 The thrusters were scratchbuilt by forming half-melted styrene over wooden easter egg shapes. 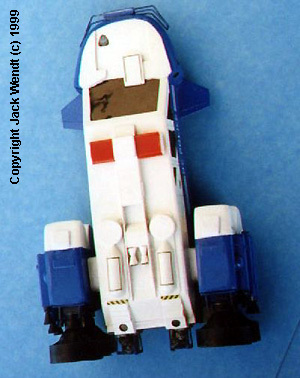 ^ The complex curves on the front of the model were built up with laminations of sheet styrene. ^ Details on the top are from a variety of sources. Again, I heated a larger piece of plastic over a candle and formed it over the eggs. It took several tries, but eventually I came up with 4 cones that I was satisfied with. I used a syringe case (12 cc) for the outside and the inside rings of each thruster cone. The outside rings are too thick, but I could not think of a suitable substitute due to its size. The material of the syringe case is the same material as a super glue bottle, so I used epoxy glue. The bottom, again no detail, just sheet plastic. I know that there are thrusters, but where and how many….if only I had saved some episodes on tape. Consider this a curbside model. I vacuformed clear plastic over a wooden rectangle to make the lights on top. I painted the inside of the lights orange with a little red. The tips are white. I used thin acetate for the front windshield and painted it gloss black from the inside, and cut to fit. I did this because the side windows looked okay, but simply painting the windshield black looked awful. I painted the headlights silver, and enclosed with clear plastic. The front bumper is wire and styrene tubing. The decals were fairly straight forward. All I had to do was cut out sections of the letters to resemble the font used in Space Precinct. The insignia is a shoulder patch I downloaded from the net. I shrunk this on my computer and printed it on glossy paper. I did not want to go get a decal sheet made just for 3 small decals, even though it is not flush with the model. The over all color is Testors™ White and Blue, from the little bottles. The blue might have needed a little more white, but that depends on which pictures you look at, and the resolution of your monitor or TV. The engines are gun metal. I sprayed dull coat on the engines, and Future on the rest, except the windshield which did not need it. Lets see, I redid the fuselage once. I redid the main engines twice. I redid the small thrusters 3 times, and the main engine cones 3 times, after heating about 14 pieces over the wooden Easter eggs. After all this, I'm pretty much satisfied with the outcome. I've seen/done better paint jobs, and there may be more slant on the windshield than I have. Not including the several months thinking about this model and looking for references on how to build it, I figure I have somewhere around 100 or more hours. The cost was less than $15. If I had the toy car from the series it might have helped, even though looking at the pictures I have seen, it does not appear to be very accurate. I must say I had fun, and that is the most important part. Last updated on 26 July 1999.